Is Skin Cancer Treatment Right for You? Over a million cases of skin cancer are diagnosed in the United States each year. Though the majority of these are located on the face and neck, skin cancer can occur on any part of the body that is regularly exposed to direct sunlight. Treatment for skin cancer allows men and women to take the next step after their diagnosis by removing tumors or lesions, reconstructing damaged facial contours and helping you look and feel your best again. Dr. Stephen Kay is recognized as one of the best plastic surgeons in the Bethesda-Chevy Chase metro area. Serving men and women throughout the Washington D.C. region and beyond, Dr. Kay has helped hundreds of patients achieve beautiful results after skin cancer treatment, and also offers cosmetic surgery procedure for face and body. Please contact us online or call our Chevy Chase plastic surgery practice at 301-951-5120 for more information on how skin cancer treatment can help you move forward after your diagnosis. Candidates for skin cancer treatment can be men or women who have been diagnosed with skin cancer and would like to treat their health while maintaining their appearance. Skin cancer treatment patients should be in good overall health and have realistic expectations about their results. Please visit our before and after photo gallery to see real patient results that are possible with a comprehensive approach toward treating skin cancer. The costs associated with skin cancer treatment will vary depending on the exact technique that Dr. Kay uses. The total charges will include Dr. Kay’s fee as well as the use of surgical facilities and anesthesiologist fee. Health insurance is required to cover skin cancer treatment. If a policy deductible makes treatment unaffordable, Dr. Kay and his staff will discuss your options for cosmetic surgery financing with you to help make your skin cancer treatment even more affordable. At your consultation, Dr. Kay will discuss your goals for skin cancer treatment with you as well as any appearance concerns you may have. Together, you can design a plan for skin cancer treatment based on your preferences, health and cosmetic needs. 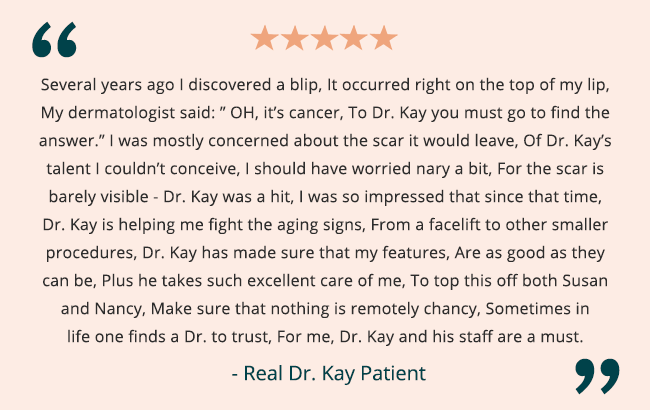 Dr. Kay is a highly qualified plastic surgeon with extensive training and experience in reconstructive surgery, including reconstruction as part of skin cancer treatment. His background provides him with the proper tools to assess each individual’s situation and create a customized approach that will maintain your health as a top priority while achieving the best possible final cosmetic results. Ultimately, the goal of skin cancer treatment is to fully remove any cancerous tissue as well as help you feel positive about your appearance following your procedure. Your recovery will vary depending on the approach that Dr. Kay takes to treat your skin cancer. Dr. Kay will provide you will detailed post-operative care instructions and inform you of the duration of any downtime to be expected. Following your skin cancer treatment, you should feel comfortable and confident moving on from your skin cancer with a fresh outlook, and enjoy natural and long-lasting results that show minimal traces of your treatment. Many men and women find that their cosmetic results offer them a deeper sense of closure following their recovery from cancer as well.